SAN DIEGO — When he was 5, George Takei, his parents and his little brother and sister were rousted from their home in Los Angeles, housed in a stable and then shipped to a World War II internment camp in Arkansas. Seventy years later, the actor best known as "Star Trek's" Sulu has not forgotten his family's ordeal. Which is why his latest role is so close to his heart: He is starring in a musical about the internment of Japanese Americans, part of what he calls "my life's mission to bring this story to a wider audience." In "Allegiance — A New American Musical" at the Old Globe, Takei portrays Sam Kimura, an elderly U.S. Army vet who looks back at the internment and how it changed his life and those of his father, grandfather and sister, Kei. 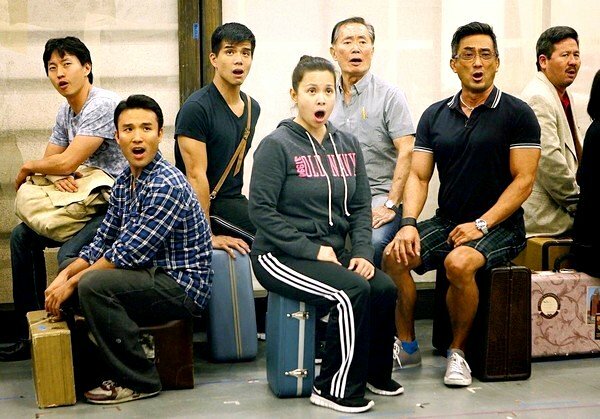 The show, which also stars Tony winner Lea Salonga and Telly Leung, follows the Kimuras as they leave their Salinas farm for the barracks and barbed wire of Heart Mountain in Wyoming. Young Sammy (Leung) fights in Europe with the celebrated Japanese American 442nd Regimental Combat Team. Kei (Salonga) falls in love and sides with internees who resist being drafted. When Sammy returns home and finds out about his sister, he feels he must choose between his devotion to his family and to his country. "This gets to a central question 'Allegiance' asks," says Jay Kuo, who wrote the score for the musical, which opens its world premiere run Wednesday. "What are the things that matter most?" "Allegiance's" characters struggle to find answers and to survive in a harsh new world. Through them, director Stafford Arima and co-book writers Kuo, Marc Acito and Lorenzo Thione try to tell the big story — the federal government's removal of about 120,000 people of Japanese ancestry from the West Coast — in human terms. Real people were affected, they say. The community was fractured. The musical incorporates several issues that divided the community. "Some of it is controversial," says Takei, "because passions are strong and because of the perspective we've taken." "Allegiance" is not based on Takei's life, but its creators were inspired by his experiences. Kuo and Thione first learned about those experiences four years ago. Kuo, a self-described "melodic composer" whose works mainly have appeared in the Bay Area, went to New York with his friend, Thione, an entrepreneur who had just sold the search engine he co-founded to Microsoft. They met Takei and his husband, Brad Takei, themselves visiting from L.A., at a play and sat near them the next night at the Broadway musical "In the Heights." A father's poignant song about his desire to help his daughter made Takei cry. "They asked why I was weeping," he says. "I told them about the internment, my father and his anguish over the loyalty questionnaire." In 1943, the government required internees to complete a questionnaire intended as a test of loyalty. Its wording and that it asked if people would swear allegiance to the country that forced them into camps prompted anger and confusion. While many answered "yes," Takei's parents were among those who answered "no" on principle to two key questions. "My father later said, 'They took my business, our home, our freedom. I'm not giving them my dignity,'" Takei recalls. His family was sent from Rohwer, Ark., to the Tule Lake, Calif., segregation center for those deemed to be disloyal. Internment's impact extended beyond the war years. In camp, Takei says, he was too young to fully understand what was going on. As a teenager in L.A. he learned more about the injustices involved and wondered why his parents' generation hadn't done more to protest. "One night, I said, 'Daddy, you led us like sheep to slaughter when we went into the camp.' He was silent. Then he said, 'Maybe you're right' and went into his bedroom and closed the door. I realized I hurt him. I felt like I should apologize, but it felt awkward and I didn't. It's one of those regrets I'll always have." Intrigued by such stories, Kuo and Thione persuaded Takei to join them in developing "Allegiance." Besides playing Sam, he portrays the Kimuras' grandfather and is helping to promote the musical, aided by his broad fan base and social media stardom (his Facebook page has more than 2.6 million fans). Thione says the Globe is producing the world premiere, but he and Kuo own a production company that would be the producer of any commercial production. They are hoping an aggressive Internet-based awareness campaign, along with the popularity of Takei, Salonga and Leung ("Godspell," "Glee"), will attract attention the show might not get otherwise because of its subject and relatively unknown creative team. "Allegiance" features a cast mainly comprising Asian-ancestry actors, some of whom have personal connections to the internment. Salonga, who won a 1991 Tony for "Miss Saigon," signed on for the first reading in 2009. "I felt a need to be a part of this," the Philippine singer-actress says, "since my husband is half Japanese American and one of his relatives served with the 442nd." Arima, a 2004 Olivier Award nominee for "Ragtime," says "Allegiance" interested him both because his father was among thousands of Japanese Canadian internees and because he likes tackling challenging works. "The first draft I read was too History Channel-ish," Arima says, "but now, the characters and not the events are fueling the story." As the characters have emerged so have themes of family and forgiveness that he thinks will resonate with a broader audience. "Allegiance's" first reading was at the Japanese American National Museum in Los Angeles. Videotapes of later incarnations were screened for potential investors, including former internees. "People had tears in their eyes," says Takei, chairman emeritus of the museum's board of trustees. "This is something that happened 70 years ago, and yet the feelings are still intense." Some who viewed earlier versions were upset with certain aspects, including the depiction of Mike Masaoka, wartime national secretary of the Japanese American Citizens League. "I've told people this is a fictional story, seen through one character's eyes," says Takei. "And it's a work in progress." "'Allegiance' delves into some historical controversies and internal conflicts within the community," says Greg Kimura, the museum's president, who has seen several versions of the show. "This at a time when everyone is revisiting the history of the camps." Masaoka, who died in 1991, is a controversial figure, says Kimura. "He is seen as a savior of the community and also as having cooperated too much with the government. "Also woven into the play are the people who signed up for the 442nd and the 'no-no boys' and others who resisted the draft because they thought their country was being unjust. Some families sent kids to fight for America and suffered tremendous losses. Other families resisted and were ostracized or went to jail. There has always been huge pride about the Nisei vets. We're coming to understand the courage of people who said no." After its San Diego engagement ends Oct. 21, "Allegiance" will be aiming for Broadway. "We know the challenges," says Kuo. "We also know how important it would be" to see a musical about the internment on the nation's most prominent stage. "This is my legacy project," says Takei. "I'm known now for 'Star Trek,' but I also hope to be known for spreading the word about this dark chapter in American history."